BlackBerry has released a new software update for its PlayBook tablet, but don't get too excited, it's not the promised BB10 upgrade just yet. The much-maligned 7-inch tablet now has access to the rebranded BlackBerry World, the new name for the company's app store, thanks to software update 2.1.0.1526, launched today. Alongside the rebrand comes the ability for PlayBook owners to make in-app purchases from the store. There's also a bunch of minor fixes and improvements to the browser and audio performance, as well as the ability to use SMS over bridge. 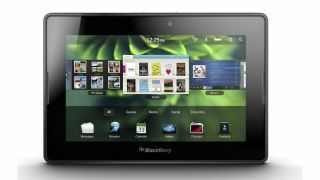 Long-suffering PlayBook owners shouldn't dispair too much as BlackBerry has promised to update the tablet with the new BB10 operating system, which will definitely give it a much-needed new lease of life. Rob Orr, BlackBerry's VP of product management told TechRadar in January: "At some point after the launch we'll bring BB10 to our PlayBooks, yes." Until then those souls persevering with the PlayBook will soldier on bravely.